Youth flight is a topic of perennial concern in Vermont. But just how bad is it? Emily Mangan, Bryan Alexander, Diane McGarry, Anna Van Dine and Daniel Luttrell all asked us variations of this question in recent months. Brave Little State is a people-powered show, where our audience votes on the questions you want us to answer — and when we put this question in a voting round, it blew its competition out of the water. Our question-askers came at this topic from all directions. Emily Mangan is one of the departed, so to speak. Right now she’s in Washington, D.C. The flight of the youth is a topic of perennial concern in this state. But just how bad is it? This month’s show gets a little personal. Brave Little State host Angela Evancie grew up here, went to college here, left for a few years, and then came back to work for VPR. And each of those choices felt really consequential — is it better to stay, or go? It’s probably fair to say that a lot of young Vermonters have this ongoing dialogue with themselves. This definitely goes for VPR’s Liam Elder-Connors. I like to joke that I’ve lived in the same square mile my whole life - but if I’m being honest, it’s more like two square miles. I grew up in Colchester, graduated from the town high school and then went to college right down the road from my parents' house, at Saint Michael’s College. And now I work at VPR, which happens to be in the same neighborhood. I’m a young person and I most definitely did not leave. But I’ve been hearing the narrative — that young people are leaving Vermont — for years. Even at my high school graduation. So when I started reporting this story, I began by asking some friends why they left. 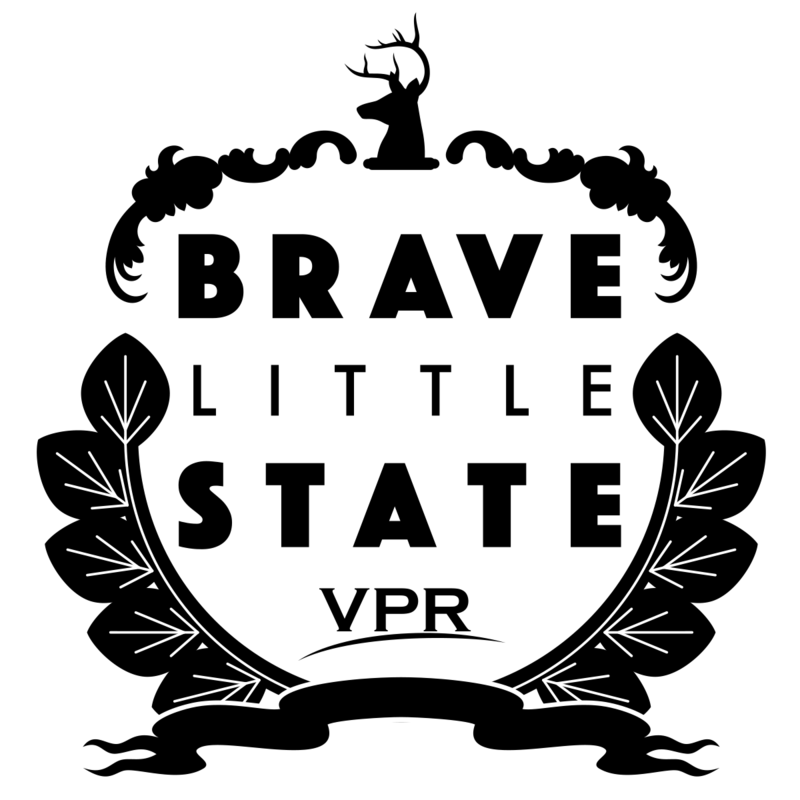 'Brave Little State' is VPR's people-powered journalism podcast. Alexandra Libstag and I went to high school together, though we haven’t seen each other or been in touch for about five years. I called her up, and after exchanging some awkward pleasantries (we couldn’t remember if we had classes together, but agreed we definitely knew each other from speech team) I asked her why she left Vermont after high school. She told me that she felt like she had to. “I felt like I needed to see something different, like I needed to kind of break out of the small town vibe and have my moment to explore life outside of Vermont.” Alexandra said. She said she might come back — someday. “You know, I guess now I see Vermont as a place to settle down. And I’m not really at a point in my life where I’m ready to settle down,” Alexandra said. Many friends have told me the same thing: They want to end up in Vermont, but first they want to see the world. At one point, I told Alexandra she should feel free to ask me questions, and she said that it was notable that I had "stuck around." As I started to reply, I began in the way that I always do: making clear that I did want to leave after high school, but it didn’t work out. I get defensive when I talk about this, because I feel embarrassed. It’s a ridiculous reaction. I like Vermont, and I like my life here. But when you’re in your mid-20s, a journalist and prone to bouts of existential dread, and when you’re staying and everyone else seems to being going, you wonder — what’s really going on here? There are many issues to explore when it comes to Vermont demographics, such as the state’s aging population, declining birth rates and migration between counties in the state. But in this episode the focus is very narrow. We’re looking at youth migration — specifically, how many young people are either leaving or moving into the state. Michael Moser is a coordinator at the Vermont State Data Center, and he walked us through some recent census estimates, specifically looking at the number of people between the ages of 20 and 44 who left Vermont — and the number who moved in — between 2011 and 2015. “If I look at the total tally…. actually, Vermont is gaining ... around 166 people within those age categories overall,” Moser said. So basically, more people came here than left. Not a lot of people, but still, it was a net gain. Kind of surprising, right? What’s also surprising is if we look at a younger age range — 20 to 34 — Vermont gains even more people. Almost twice as many. So maybe we can all relax a bit about this idea of youth flight. The recent numbers don’t show a grand exodus. But, at the same time, our gains aren’t huge. Also a disclaimer: This data comes from the American Community Survey, which uses sampling. And for Vermont, which has a small population, that means a high margin of error. “The margin of error in some cases is greater than the actual number that we're talking about,” Moser said. But according to Moser, this data still gives us a sense of what migration in and out of the state looks like. And we were losing young people just handful of years ago. Between 2006 and 2010, the net migration was negative, meaning we lost young people — around 230. “We've gone from loss relatively recently to gains,” Moser said. Those losses can get stuck in our heads, especially living in a small state. You might know a few people in your town that move away, and that small number can feel enormous. It feels even bigger when you never meet the people who are moving in. “These losses that we had been experiencing and that we are experiencing are still on our minds, even though maybe the picture may be changing as we go forward,” Moser said. Even though the numbers don’t show a massive youth migration out of Vermont, people do still leave. And when that happens, we want to know why. Enter Cheryl Morse, a professor of geography at the University of Vermont. A few years ago, she and some colleagues looked at why people leave, stay and come back to Vermont. The Vermont Roots Migration Survey heard from more than 3,600 current and former Vermonters. “When we started reading people's responses there was so much joy, heartbreak, attachment, emotion in those responses,” Morse says. Morse says her team expected to hear that people were leaving solely because of jobs and the high cost of living in Vermont. But it turned out to be more nuanced. Love our show? Support Vermont Public Radio during the station's April pledge drive. For a limited time, score a fancy new Brave Little State T-shirt with a gift of $150. Thanks for powering our public service! Click here to give. Morse says the “leavers” were also looking for cultural diversity. “About 20 percent of the people said that they left Vermont because they expressly were seeking more diverse experiences and encounters with people from different backgrounds,” she said. Overall, though, Morse said the survey just scratched the surface. Here’s the thing. This preoccupation with people leaving is nothing new: It’s been on people’s minds literally since Vermont became a state. Mudgett is going to take us way back to Vermont’s first decades as a state. About 30 years after Vermont was settled, people were leaving. They were going west, where it was flatter and the land was easier to farm. “You start to see Vermonters leaving and writing letters back to relatives still in Vermont, kind of coaxing their brothers and their cousins to join them,” she says. (Not that anyone would want to do that last part, but whatever.) Mudgett says pretty soon, people were having conversations that might sound familiar. “You start to see Vermont culture-makers, Vermont political leaders worrying about the fact that their kids are leaving, that their kids may leave,” she says. They were so worried that schools developed a Vermont-centric curriculum. “And the motivation was to instill in Vermont children an appreciation of the natural landscape,” Mudgett says. "'Tis here in Vermont, the land of green mountains, I chose to remain, contented to dwell. Among the green mountains, the lofty green mountains, the cloud-capped green mountains, contented to dwell…’ There are other lines in the poem about having johnny cake and other corn-based foods and butter and cheese and how that’s not only good but perfectly adequate." So along with our long-standing localvore tradition, the worry that Vermont isn’t a place for young people stretches back into our history. “We’ve worried about out-migration since right after we got settled. It’s like we didn’t even have time to get comfortable,” Mudgett said. 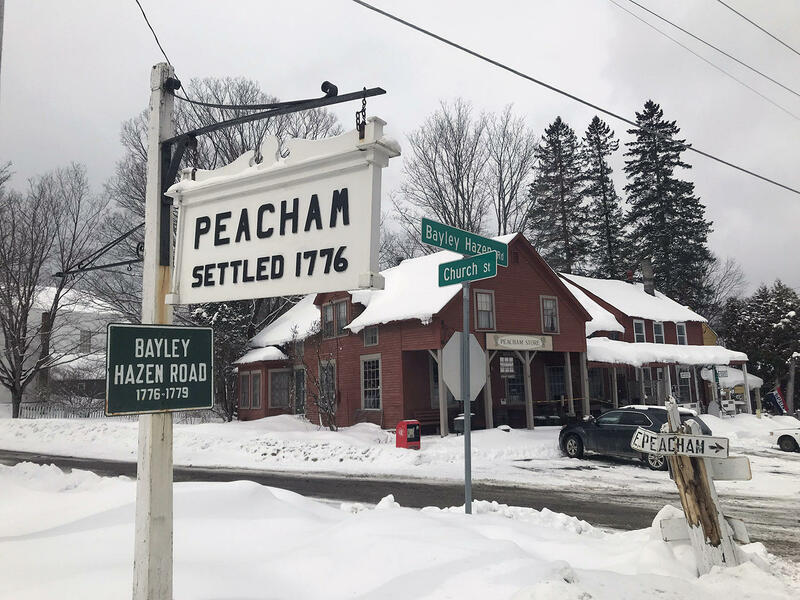 Now, whether youth flight is an existential concern, or something that you can just barely see in the numbers, there is a Vermont town where the story is very different. A town that seems to attract young people like moths to a barn light. There are no main routes running through the Northeast Kingdom town of Peacham. It's a town, people who live there say, that one has to decide to go to. Rachael Moragues and her husband Marc were living outside Los Angeles when they began scheming to move somewhere else. They didn’t like the city, didn’t want to raise their family there. So they spent a bunch of time online researching possibilities. They wanted something low-key, with more personalized teaching in the schools. And they eventually chose Vermont. Rachael, who’s 33, ended up making the move without her husband. Last April, he died unexpectedly from a brain tumor. But Rachael was committed to their plan. And by the end of that same month, in a true feat of resolve, she’d packed up her life. She spent the month of June driving around the state looking at rentals. One of them was in Peacham, in the Northeast Kingdom. It’s about 20 minutes from St. Johnsbury, and 45 from Montpelier. But there aren’t any main roads passing through it. It’s a town, people say, that one has to decide to go to. And when Rachel got there, she wanted to stay. Now, there are a lot of towns in Vermont with a small school and a paved road running through the middle. But it’s easy to see why Rachel was drawn to Peacham. It is over-the-top charming. Rachael Moragues, 33, climbs the steps of the Peacham Cafe. Rachael moved to town from California with her two young sons last year. The village has a cozy cafe and a white steeple church next to a big red barn, with views of the White Mountains in the distance. It was snowing big flakes on the day Brave Little State visited, and the entire scene felt like a Vermont-y Instagram photo. 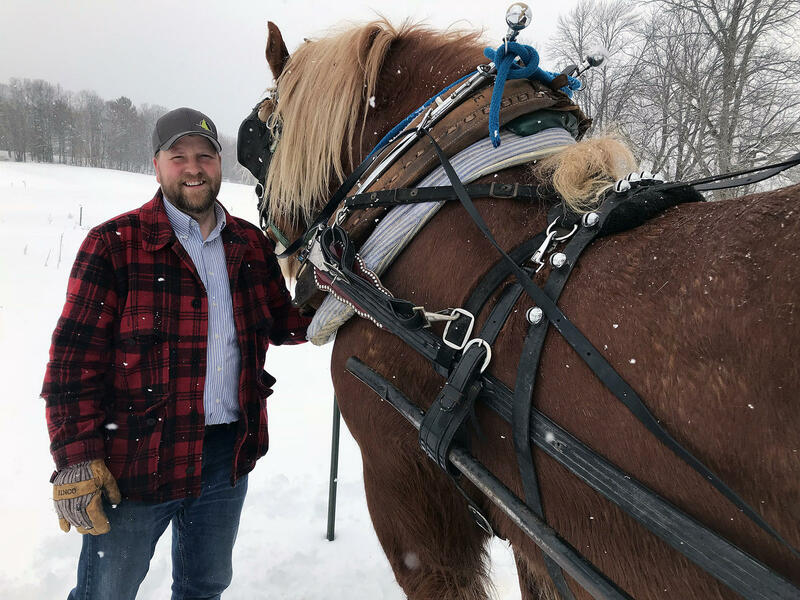 It’s the kind of place where, when you set up an interview with the town clerk, he invites you on a horse drawn sleigh ride, pulled along by a gentle Belgian draft horse named Pete. Thomas Galinat isn’t just the town clerk; he’s also the town treasurer. And like Rachael, he’s in his thirties, relatively new to town, and a parent of two. He and his wife Hanna moved here in 2013. “So there’s the village," Tom explained from his sleigh, having stopped at the top of an open field. "We’re kind of looking down over the town, the cafe, the church, the barn. And then out this way is a series of hillsides with scattered farms throughout, like you could imagine in a Norman Rockwell painting." Norman Rockwell might have appreciated the fact that Tom built this sled out of old bookshelves from the Peacham library. And he’d probably appreciate Tom’s glee when Pete the horse breaks into a gallop. It’s infectious. Thomas Galinat, Peacham's 35-year-old town clerk and treasurer, poses with his one-eyed Belgian draft horse Peter. Tom and his wife Hanna moved to Peacham in 2013. Tom’s extended family has a long history here, of farming, among other things. And he balances his duties for the town with similar work. Tom echoed a widespread sentiment in Peacham: That people who come to town do so very deliberately. Timothy Scott: It’s the, at one time, I don’t know if this is still true, the most professionally photographed town in the state of Vermont. It’s what I think a lot of people outside of the area imagine Vermont to be like. Jennifer Burchell: I have always lived in large cities, larger towns, this is actually the first time I’ve lived in a small town. And I have to say I really love it here. Jeff Lane: We had to have cell service and we had to have broadband internet for my wife to work from home. Eric Kaufman: We have five large dogs, and we don’t like having nextdoor neighbors. Alfred Dedam: When I was 20, 21, I wanted to get pretty good and gone, and I did. And I don’t know, I guess absence makes the heart grow fonder. Hanna Galinat: There was a woman in town who just passed who had the same birthday as my oldest son, and so on his birthday he would pick apples and make applesauce and bring it to her for her birthday. And she was 101. That kind of connection, I think, doesn’t happen elsewhere. Geoff Sewake: Someone will bush-hog your yard if you need it. It’s sort of that borrow-share community spirit that makes this place so lovely to live. Kristen Speer: We ended up buying my grandparents’ house here, so that was kind of a decision-maker, but we did like Peacham just for school choice options. School choice. In Peacham, this means that after sixth grade, parents can choose to send their kids to the private St. Johnsbury Academy, or the public Danville High School or the independent Lyndon Institute, or others. That, and the quality of the Peacham Elementary School, were part of basically everyone’s decision to live here. Geoff Sewake: My wife and I chose Peacham largely in part because it was a local small elementary school. Jennifer Burchell: My motivation was checking the schools. Alfred Dedum: The ability to choose the high school that our children would go to. Rachael Moragues says it’s like a parent’s dream. Even the Peacham school bus driver is a youthful 42. Jeff Lane used to work as an avalanche forecaster for the White Mountain National Forest. Now he makes the daily rounds with his 2-year-old son Fletcher snoozing in the front seat. “We moved here about a year and a half ago. We wanted a small town with a good school and a really tight community,” he says. With all these young families coming into town, enrollment in the elementary school is up 34.7 percent since 2012. Which is kind of remarkable, given that most Vermont schools are watching their numbers tick down. And is Mike the youngest public servant in Peacham? Of course he isn’t. You probably remember Tom Galinat, the 35-year-old town clerk with the draft horse. Tom says town governance is stacked with 30-somethings. Peacham is striking an interesting balance. On the one hand it’s having a love affair with its past, and on the other, it’s actively staking out its future. So maybe with the right combination of old and new, you can attract young families. “It's really the 30-year-olds that we need, and those are the people who are actively engaged in work and pay taxes and coach little league teams and do all those things that make society function,” says Cheryl Morse, the UVM professor who led the Vermont Roots Migration Survey. Morse says that instead of just fretting about the young people who are leaving, we should be paying more attention to those who are here. And if you feel like you don’t know anyone in this category, well, come to Peacham, and you’ll meet some pretty quick. One more thing before we wrap up. 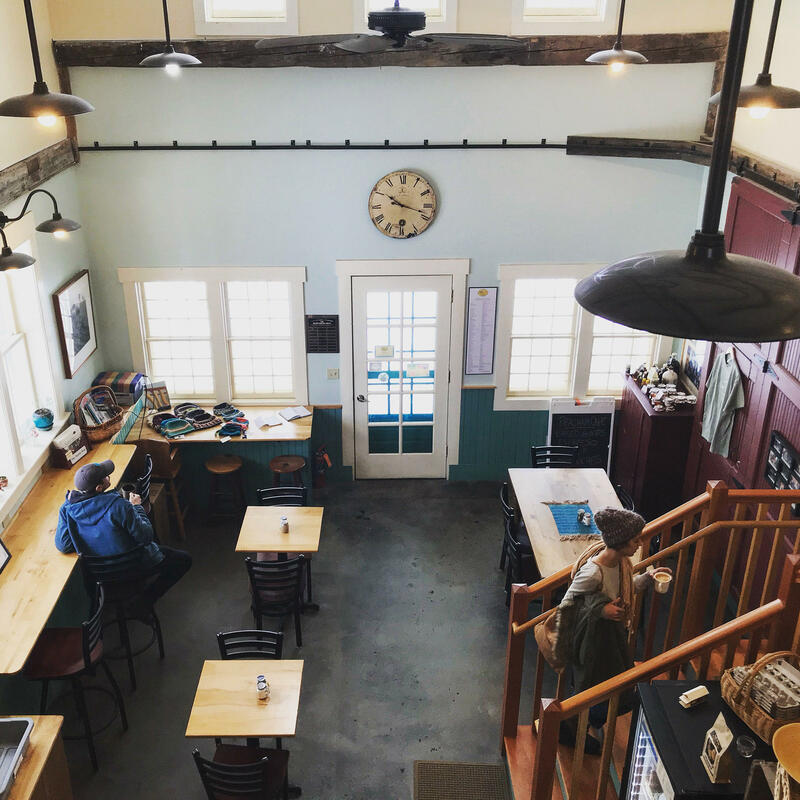 If you are hoping to move to Vermont, or back to Vermont, a few new initiatives have been announced recently that we want to highlight. First is a new program called Stay to Stay, just launched by the Vermont Dept. of Tourism and Marketing. It features a series of long weekends around the state, where people can come check out a community and meet potential employers and neighbors and community leaders. There are four weekends planned from April through October. Second, the Vermont State Colleges System is offering a “Welcome Home” tuition policy to Vermonters who graduated from high school in 2015 or later, and then moved away. Come back to live in Vermont, and you could be eligible for in-state tuition rates immediately. Brave Little State is a production of Vermont Public Radio. We have support from the VPR Innovation Fund, and from VPR members. You can show your love for our podcast by pitching in to support the station. Special thanks to Geoff and Gillian Sewake, Morgan Gold and Michael Moser. Is The Northeast Kingdom Really So 'Different'? Just how culturally different is the Northeast Kingdom from the rest of the state? Can it be quantified in any way, or is it largely legend? Who Oversees Vermont's County Sheriffs? If Vermont’s county sheriffs are accountable to their voters, but most of their voters don’t pay much attention to them, what happens when they do something wrong?